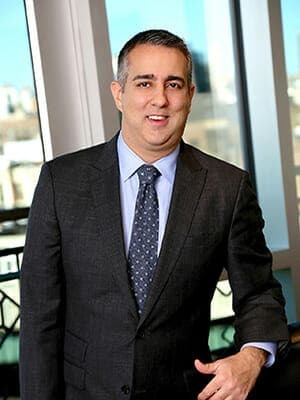 Nicholas Rupwani has been practicing workers’ compensation law since August 2004. He has represented claimants before the Workers’ Compensation Board in all aspects of their claims. Prior to his arrival at Pyrros & Serres, Mr. Rupwani was the lead trial attorney for a large employer in Westchester County. His past defense experience affords him unique insight to anticipate and counteract defense strategy controverted or otherwise contentious claims. While at Syracuse, Mr. Rupwani was a member and Associate Editor of the prestigious Syracuse Law Review. He served the Syracuse community by taking part in both the Syracuse University Criminal Law Clinic and as a teaching assistant the Street Law High School Externship Program, a College of Law program where law students taught law and government at local high schools. At Hartwick College, Mr. Rupwani graduated with departmental distinction in history, was a member of Phi Alpha Theta, the National History Honor Society and was a Samuel Nelson Scholar. Mr. Rupwani was also a four-year member of the Hartwick men’s varsity tennis team. In his free time, Mr. Rupwani enjoys traveling, the many great restaurants New York has to offer. He is a die-hard fan of the Syracuse Orange football and basketball teams.